Update: There should be 4 photo collages below. If you can’t see them all, check out my Flickr. I’m starting a new experiment. It has to do with cutting a smaller size for my back. I’m still in FBA land, but cutting a smaller back will hopefully eliminate all the bunching I’ve been having to take out and save me time during the fitting stage. Here you can see, side by side, the new version of Gertie’s Portrait Blouse (though honestly, without the design darts in the front and back, it feels like a tee…which is totally fine) next to the first try with this pattern. The first try was done in a voile while the subsequent tries were done in knits, to maximize success. 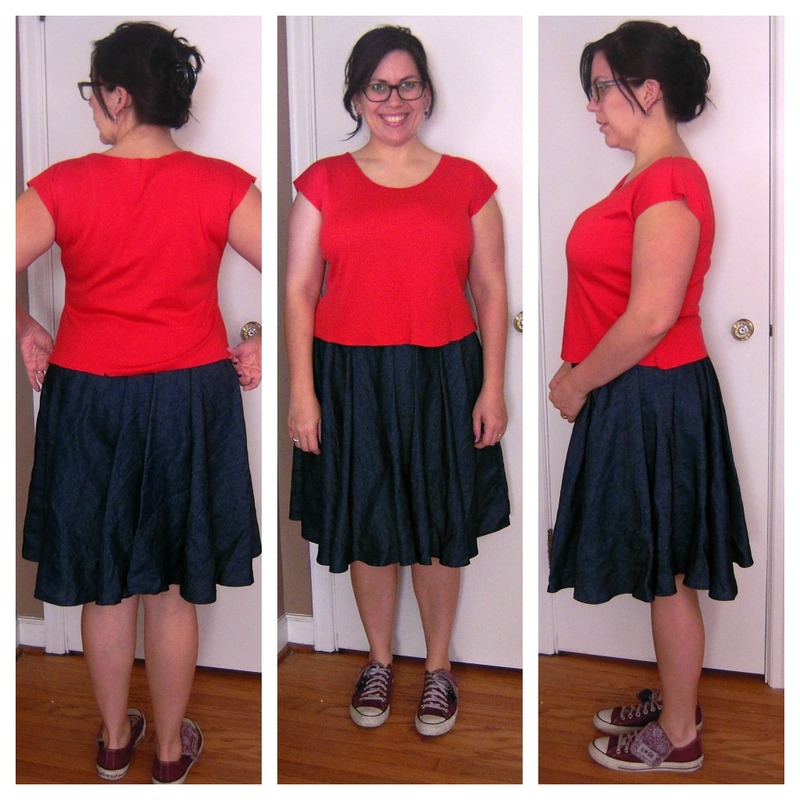 I used the size 10 for the front and the size 6 for the back on the red blouse. Can you tell the difference? Now, I kept wanting to do this smaller back experiment so I whipped up this red Portrait Blouse, without the darts, in a knit. Comments on fit or wearability? I absolutely love the side view where you can see that I’m on to something with the smaller back thing. Smooth! This is what I’m dubbing my Tarzan top. I’ve actually always wanted to make a one shoulder top. The fabric is from the April Johnston Spring collection. I got it in the remnants bin and there was 3/4 yard so I figured I should go for something that used the least amount of yardage. I used Simplicity 2364 and cut the size 10 for the back and since I bought only the envelope with the smaller sizes, I graded the size 14 up to a 20. I didn’t add an FBA because it’s a knit. The instructions called for gathering the shoulder. I left it un-gathered for muslins sake. Cutting a smaller back was looking like a good solution so I cut another of Gertie’s Portrait Blouses, again without the darts. I’m quite happy with the results of this experiment. For the middle picture, my daughter wanted me to take a picture with her kitty. I might still be needing to take out some length from the back at the waist. The Tarzan top could’ve used some more room in the back waist. I still need to cut shoulders for the smaller, back, size. Matching up the shoulders during the cutting process and truing the seams taught me that. I still need to take a bit out of the front upper chest for the gaping above my chest, a normal hollow created by a larger chest. Any other changes you see that I should be making? Do you cut a different size for your front compared to your back? What a great idea, the fit is sooooo much better! Yes, I agree the fit is better. From the red & blue tops I still think you need an FBA because the bodice is falling away from your body, from the bust. And FBA would add the fabric you need through the length & width of the bust and bring the bottom of the top back into fit you through the waist and high hip. You may need to do the short-waist adjustment on the back, too. I have similar fitting issues, and I find I also need to do a high-hip adjustment in the back/side. I’ve got a lot of fluff just below my waist that requires a sharp grading up one size within 2 inches. Good luck, and keep experimenting. Your DD’s kitty is adorable, btw! thank you! I agree with the fba for all that. I’ll have to keep experimenting to see what I can do in the back waist. My fit issues are very different from yours, but it is still really interesting to see your solutions! 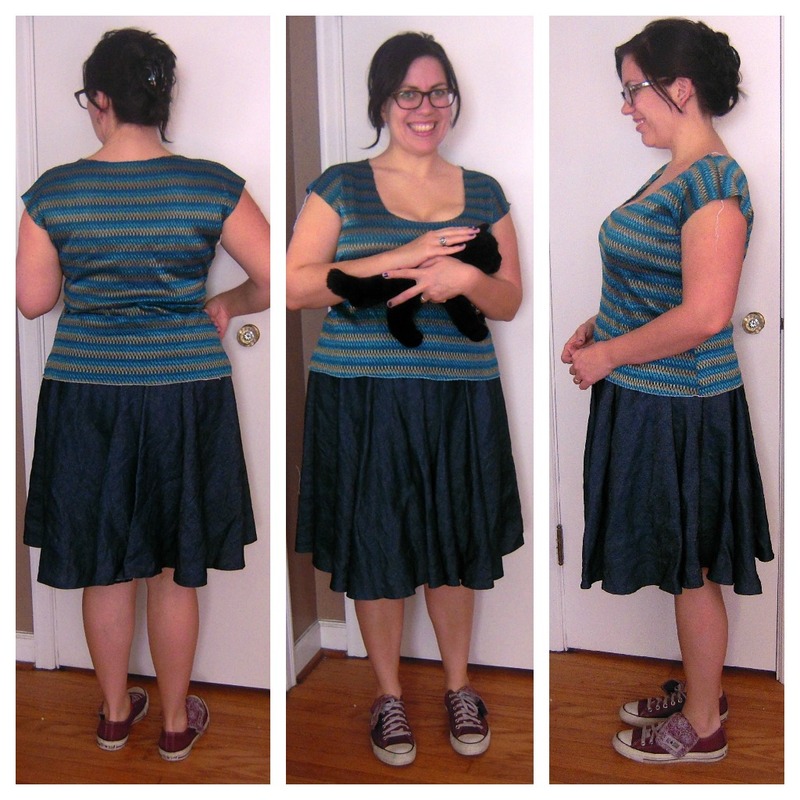 My sister is built very much like you, so I’ve helped her fit/alter some of her store-bought clothes – but it’s so much better (and easier!) to start from scratch to really perfect the fit. Keep it up and you will soon have a wonderful collection of basic patterns to use as starting blocks! Thanks, Brooke! it IS so much easier to just start from scratch. I totally agree. 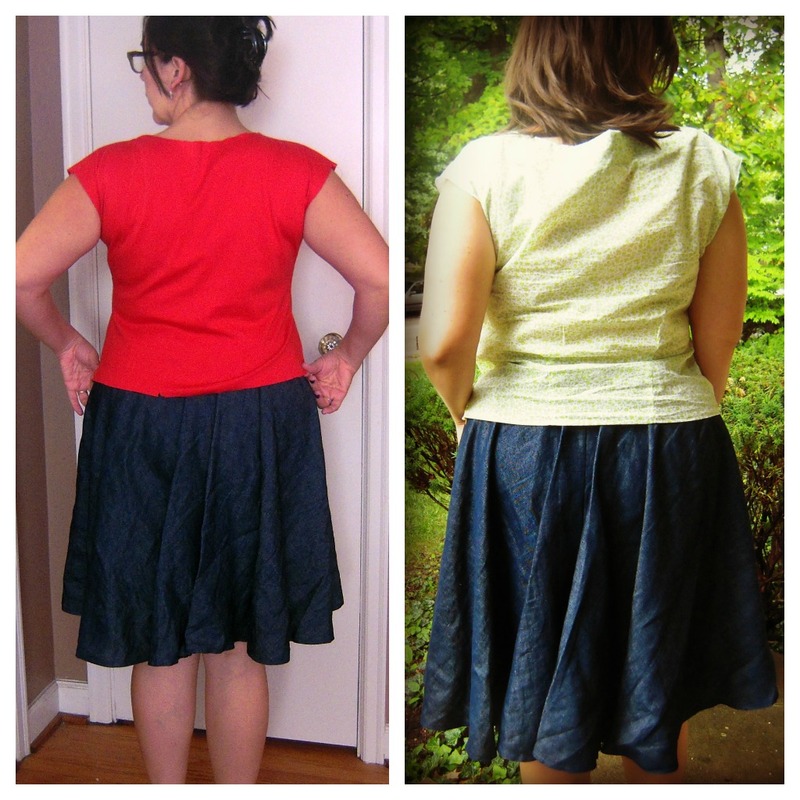 I like seeing how people with different body types than mine alter their patterns. I think it helps me, too. Thanks, Erin. I think I like the last one best, too. I wore it the rest of the day after I took the pics, so perhaps that says I like it…or I’m superbly lazy. thanks for the comment. Thanks! I think fitting garments is the sort of thing nobody would notice unless you see a before and after picture, y’know? The reward of a well fitting garment is pretty thrilling for me right now. That upper chest area above the bust? I had a tailored suit made that was actually padded there instead of fitted. 30 years ago. Hmm, couldn’t bear to toss it. If I can find it, maybe some alterations are in order! Interesting that they’d pad it. I had heard of padding in costuming but hadn’t thought of padding on daily wear. I look forward to seeing what you learn. It’s giving me a lot of food for thought. Making a smaller back is a fantastic idea. How clever! And your tops look so great. thanks! I’m not very humble right now but I feel pretty clever. hehe It’s such a light bulb.